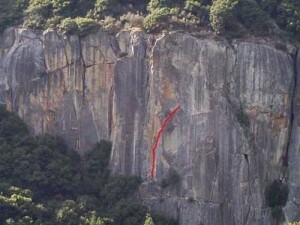 The scene of one death, the first 20 feet of this stout 5.10a are difficult to protect. Climb the arête past thin protection and move right into the right-facing corner. Lieback and stem the corner to an interesting overhanging stem box. Hand and thin hand jamming past the overhang leads to the bolted anchor. Continue above and right to gain the Wheat Thin belay ledge. Which SuperTopo guidebooks include a topo for Beverly's Tower?